and I have to say that it has paid off." Convey 1.8 million words to your customers in just 1 minute. That’s the power of Animated Video. to understand concepts easier to explain. Why would an animation be useful to me? Animation can take a number of different forms and can be really useful in explaining difficult concepts or demonstrating how a particular product works. This is because animated visuals can convey far more information, in a quicker and more enjoyable way to potential customers than a lengthy piece of text. Additionally, animation can be a powerful part of a brand identity, when used as part of a larger video campaign. 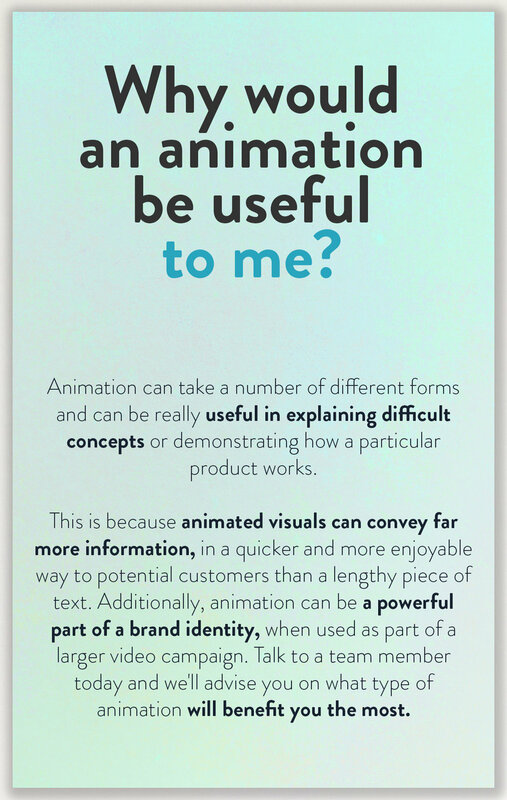 Talk to a team member today and we'll advise you on what type of animation will benefit you the most. Is animation really a proven concept? Animated explainer videos have been proven to increase conversion rates by as much as 20% and the majority of viewers say that watching a product explainer video makes them more confident in their online purchasing decisions. Given that the average attention span is now just 8 seconds and explainer videos convey information 60,000 times faster than text, the benefits are clear to see. "The animation has proved to be a success in some unexpected quarters, even without any serious “advertising” of its release and I am most content with it indeed since, as intended, it is clear, decidedly different to most company video output (deliberately so) and will have a substantial shelf life. Very happy indeed." that live video either struggles to or simply can’t. audience, in a format they desire. more along the lines of what we’ve been looking for. I’m sure we’ll be in touch again down the line." Are there other uses beyond online? Yes! Animated stings and logo sequences often form part of the screen materials for a live event, or are used to punctuate content in a video programme and are created using motion graphics. These can include 2D or 3D animation along with graphic elements from your branding. We've produced plenty of these over the years and you can find examples of our work in our showreel. But what about live video, isn;t that better? Live video does a lot of things very well, but you don't always have access to all the physical material required, or perhaps it doesn't even exist yet! Imagine you're trying to explain a prototype concept through live video alone, it simply won't work inless you've got a physical mock up already created. This is where animation can be combined with live video to create a simple and cost effective solution that's proven to deliver results.